Michael graduated from the United States Military Academy in 2004 with a B.S. in Philosophy and was commissioned as an aviation officer. Throughout his eight years of service in the U.S. Army, Michael deployed to both Iraq and Afghanistan, flying cargo helicopters in support of multiple combat missions. He just recently completed his Company Command of the Army’s largest UAV training program. Amy, whom he met at West Point, graduated from the United States Military Academy in 2005 with a B.S. in Human Factors Engineering. 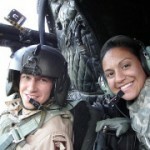 As an engineer officer, Amy deployed to both Iraq and Afghanistan as part of the 101st Airborne Division. After five and a half years of service, she transitioned to a sales and marketing role at PepsiCo and continues to serve in the Army Reserve. Amy and Michael both joined the Wharton MBA Class of 2014. They are both excited to join Service to School and help transitioning veterans leverage their leadership and military experience into success in the business world.